What do tweets, Vines, superhero films, and lists all have in common? Answer: They are all deliberately designed for a generation with shorter attention spans. In this digital age, it feels impossible to work in a tech-dominated industry without coming to the conclusion that the world as a whole, especially the younger generations, have shorter attention spans than ever. The average American attention span in 2015 was recorded at 8.25 seconds, roughly one second less than that of a goldfish. The creation of the aforementioned social media sites and the popularity of business blogs suggests that the marketplace is rapidly adapting to these changes in attention spans. What can you as a business owner with an online presence do about this then? One word: titles. They might be the most fundamental aspect of a blog post, but they are also one of the most pivotal and challenging steps to securing traffic on your website. Bad blog post titles can send a potential reader away faster than you can say “elearning”, while original, attention-grabbing titles can keep them following blog post links on your site for hours. 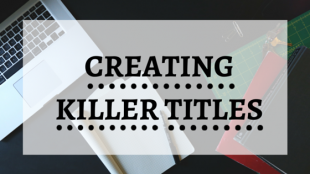 Below is a quick guide to creating titles, step by step. Before you begin brainstorming (Step 2), consider the target audience of your blog post and imagine what kind of titles they might respond to. General popular formats include “How To” posts or lists like “7 Ways to Improve Your Life” (see the title of this article). The second part of this step is to try and tell the audience how the content in your blog post applies to them. Let them know why they want to read your article and address them, as they will become more inclined to click on the link. Easy ways to do this include, “Find Out How You Can…etc.” or “Top 5 Secrets To Help You…” titles. Brainstorm as many titles you can think of; exclude nothing. Oftentimes when people have writer’s block or “blogger’s block”, it’s because they’re afraid of making a mistake. Write down all ideas good and bad because you’ll never know when you’ll find a diamond in the rough! If you find yourself to be stuck, read this article by James Altucher on becoming an idea machine. Seriously, read it even if you aren’t stuck. The Psychology of Storytelling: What Can eLearning Creators Learn from Star Wars? You’re eyes are drawn to the more unusual words and adjectives, and it makes you that much more curious, leading to increased readers. Once you have your list of unique titles, it’s time to cut the words down. Typically, a solid title will be anywhere from 5-8 words, so trim down any that seem redundant or phrases that could be replaced with one word. If a reader spends too much time figuring out what the title means or reading it to begin with, they probably won’t bother to give the post a chance. (Bonus Step Five): Link to other blog posts within the article. This last step is optional, but if you can link to other blog posts with intriguing titles on the sides or on the bottom of the blog post. It increases the odds that the reader will continue perusing around the site for a while, or opening up new tabs to read the articles later. The longer you can keep their attention, the better. At the end of these steps, you should have a concise, attention-grabbing title that can make worlds of differences in increasing traffic to your blog. These steps can be followed with precision, taken out of order, or ignored if they do not apply to you. Pick and choose what works best, and don’t forget to be creative.